Data from roughly 275,000 groundwater samples in the High Plains and Central Valley aquifers show that many Americans live less than two-thirds of a mile from wells that often far exceed the uranium guideline set by the Environmental Protection Agency. The study reports that 78 percent of the uranium-contaminated sites were linked to the presence of nitrate, a common groundwater contaminant that originates mainly from chemical fertilizers and animal waste. Nitrate mobilizes naturally occurring uranium through a series of bacterial and chemical reactions that oxidize the radioactive mineral, making it soluble in groundwater. 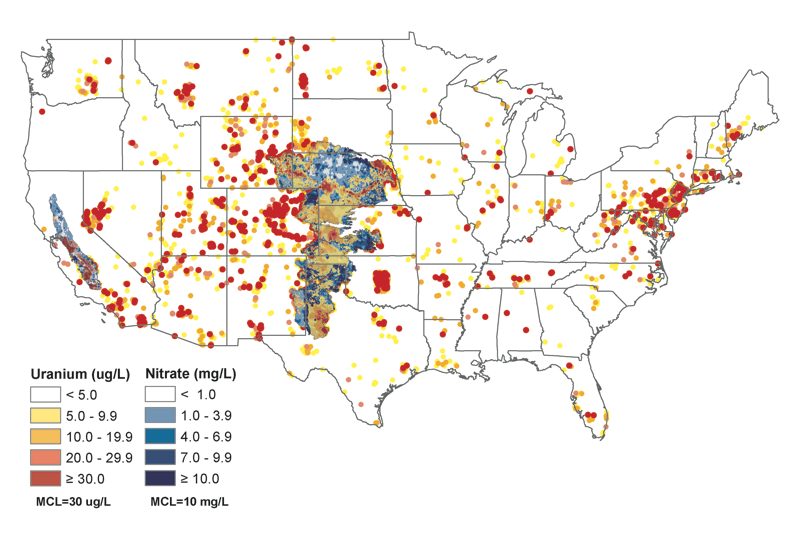 UNL researchers Karrie Weber and Jason Nolan found that the High Plains aquifer contains uranium concentrations up to 89 times the EPA standard and nitrate concentrations up to 189 times greater. The uranium and nitrate levels of the California-based Central Valley aquifer measured up to 180 and 34 times their respective EPA thresholds. The authors published their findings in the August edition of the journal Environmental Science and Technology Letters. Their research was funded in part by the U.S. Geological Survey. 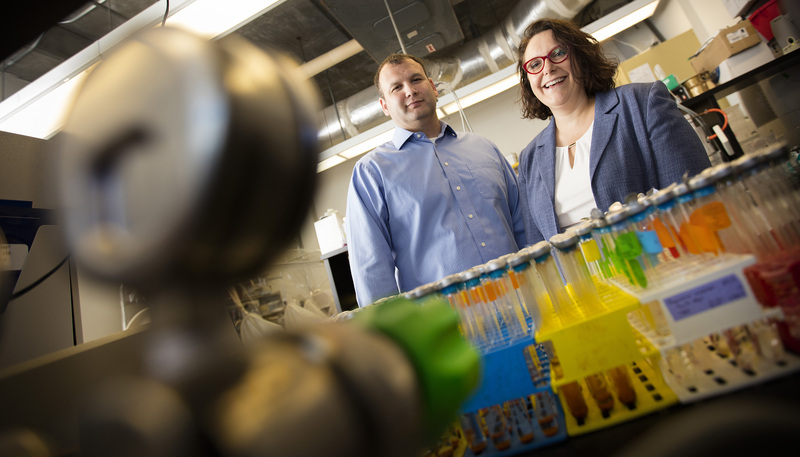 "It needs to be recognized that uranium is a widespread contaminant," said Weber, assistant professor of biological, Earth and atmospheric sciences. "And we are creating this problem by producing a primary contaminant that leads to a secondary one." Prior research has suggested that prolonged drinking of uranium-contaminated water may lead, or make people more susceptible, to kidney damage and elevated blood pressure. According to Weber, peer-reviewed studies have also indicated that food crops can accumulate uranium when irrigated by water containing high concentrations of it. The High Plains aquifer -- the largest in the United States -- provides drinking water and irrigation for an eight-state swath that stretches from South Dakota through Nebraska and into northern Texas. As California's largest reservoir, the Central Valley aquifer sits beneath some of the state's most fertile agricultural land. According to a 2012 census from the U.S. Department of Agriculture, the two aquifers irrigate cropland that accounts for one-sixth of the annual revenue generated by U.S. agriculture. The researchers also determined that only one of the six wells located near a former or current mining site was contaminated. This finding counters the notion that uranium contamination stems primarily from mining operations or spent nuclear fuel, Weber said. "We hope that this study serves as a catalyst to get other people interested in this issue," she said. "If the problem is this widespread, more research needs to be done. We're limited by the data that's been collected, and uranium isn't often monitored." Weber said the expense of water treatment plants -- specialized facilities that can cost tens of millions of dollars -- often puts them out of financial reach for smaller and rural communities. Addressing the issue might require managing groundwater and focusing on the aquifers' sediment, which houses bacteria that can help control uranium by breathing and eating it, she said. Regardless of the approach, Weber said it is important for decision-makers and researchers to account for the presence of uranium in U.S. water sources. "When you start thinking about how much water is drawn from these aquifers, it's substantial relative to anywhere else in the world," Weber said. "These two aquifers are economically important -- they play a significant role in feeding the nation -- but they're also important for health. "What's the point of having water if you can't drink it or use it for irrigation?"